(astronomy) Abbreviation of Messier, used in Messier numbers. (biochemistry) Abbreviation of methionine, as established by IUPAC. (chemistry) Abbreviation of molar (one mole of substance per litre of solute). (mathematical analysis) A generic manifold. 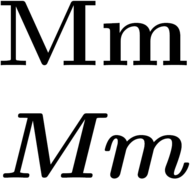 Because of the potential for confusion, the abbreviation for unit "molar" is usually written in italics (M) or in small caps (ᴍ). (US, roadway) Michigan. Usage note: this designation is usually used only within Michigan. The seventeenth letter in the Afar alphabet. From English menstruation or menstrual cycle. The thirteenth letter of the Dutch alphabet. (text messaging) Abbreviation of mi (“me, I”). The thirteenth letter of the French alphabet, preceded by L and followed by N.
The thirteenth letter of the German alphabet. The eleventh letter of the Italian alphabet, called emme and written in the Latin script. The sixteenth letter of the Romanian alphabet representing the phoneme /m/. Preceded by L and followed by N.
The twentieth letter of the Saanich alphabet, written in the Latin script. The 14th letter of the Slovene alphabet. Preceded by L and followed by N.
The eighteenth letter of the Somali alphabet, called miim and written in the Latin script. The eighteenth letter of the Somali alphabet, which follows Arabic abjad order. It is preceded by L and followed by N.
The fifteenth letter of the Vietnamese alphabet, called e-mờ, em-mờ, or mờ and written in the Latin script.